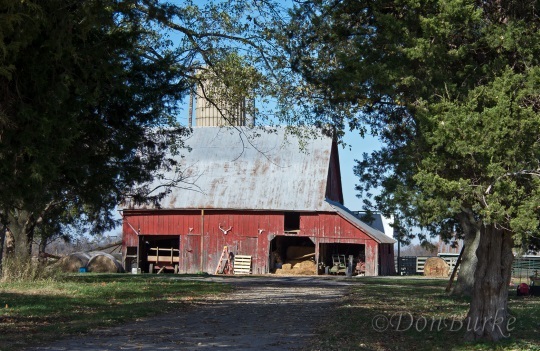 Don Burke today shares photos from a little visit to the Belle Rive/Opdyke, Illinois Amish community, taken last autumn. This is a small community in southern Illinois (Jefferson County), two church districts in size. As a state, Illinois ranks #10 in its total Amish population, which is dominated by the large Arthur settlement. 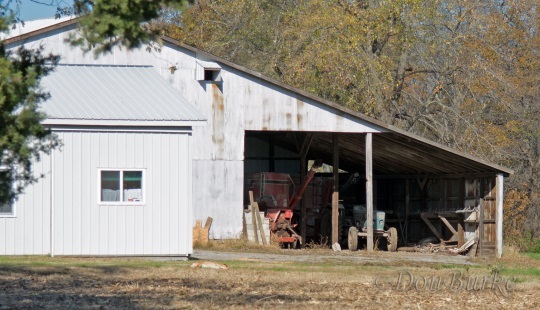 In the fall of 2014 I took about three days to visit several Amish communities in the southern Illinois and western Kentucky area. One of those passing visits was in the Belle Rive / Opdyke, IL settlement. 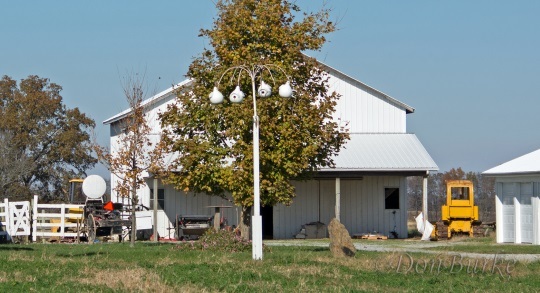 Some of the Amish homes in this community had the characteristic Amish feel to them, while many of them did not stand out as particularly Amish, but looked fairly contemporary. There were the customary phone shanties here and there…. 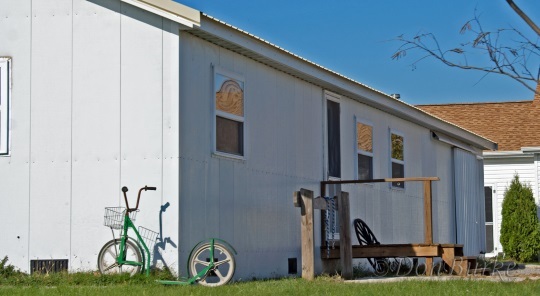 …and of course the typical Amish schoolhouses and playground activities. A closer look at the schoolhouse shows the community’s use of scooters (I don’t recall seeing a regular bicycle anywhere while I was there)…. …and here is another scooter I noticed at one of the homes. 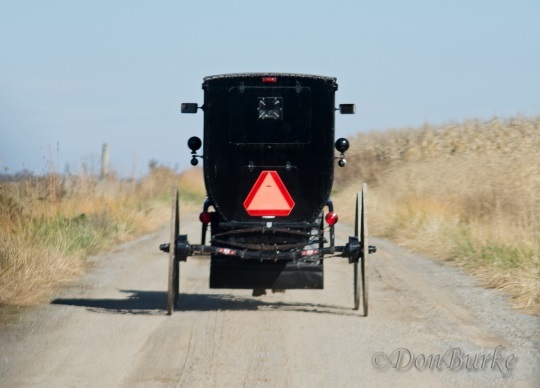 I’m told that the Belle Rive settlement traces its history to Amish in Delaware, and that the buggies still show design characteristics from that area. …and even heavy machinery (notice the yellow bulldozer on the right). 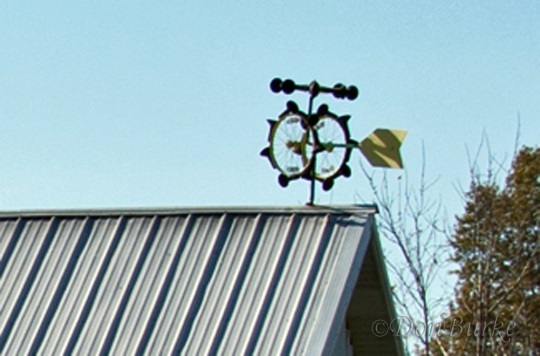 …the not so subtle wind vane on one Amish shop…. 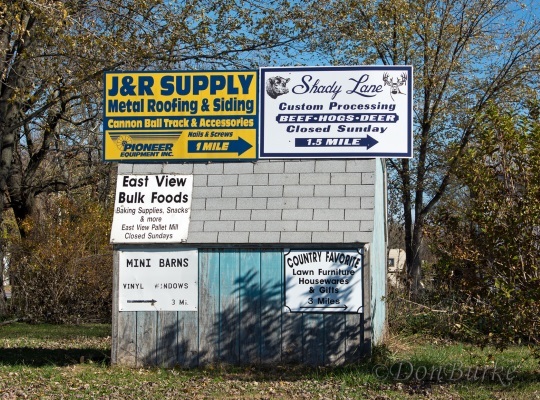 …signs for some of the Amish businesses, which were a bit more fancy than most Amish signage…. 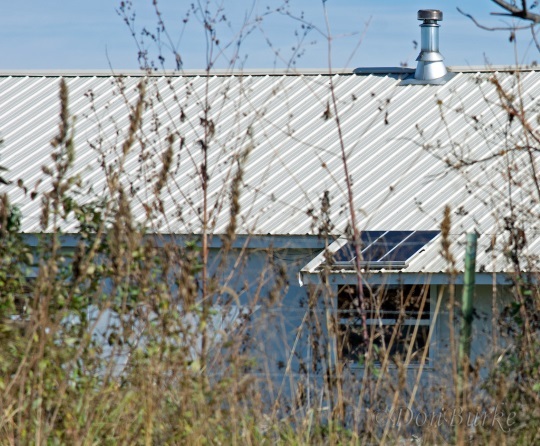 …and at least one Amish hunter who mounted his trophy deer and elk antlers on the barn near the road for all to see. As I said, my trip through Belle Rive was mostly a passing-through visit, but I did make one stop at a bakery and bulk food store for a donut and a brief-but-enjoyable visit with the Amish lady that run the shop. And in case you’re wondering, yes, the donut was really good! Nice photos – thanks, Don! Thank you Erik for allowing me another chance to share one of my visits to Amish land on AmishAmerica. If it’s okay to mention this, anyone who would like to see more of the 83 pictures from my short visit to Belle Rive can see them by going to https://www.flickr.com/photos/ozarkinspirations/sets/72157653633354863 . Judy, I visited Kalona about a year-and-a-half ago. Erik featured some of the pictures from that visit here on AmishAmerica (http://amishamerica.com/amish-kalona-iowa/), and you can see more from that trip in my online albums (https://www.flickr.com/photos/ozarkinspirations/collections/72157643479395824/). The only contact that I know there is Nancy (kalonatours@kctc.net), who is quite possibly the same person that you have contacted through the chamber. Nancy gives tours through the Amish country there (although I didn’t participate in one), and seems to know the Amish community pretty well. She would be the person I’d talk to for help if I were in your place. You are very welcome, Judy — glad to help. I leave about an hour out of St. Louis, which makes me some 5 hrs from Kalona. Kalona is the only Amish community in IA that I have stayed in, and only had a passing visit through another community — I think it was Mercer (?). So I really can’t tell you much about IA Amish areas. However, if you’re willing to venture just a little farther south, across the state line into MO, I have been to/through a number of the communities across the northern part of the Show Me state. 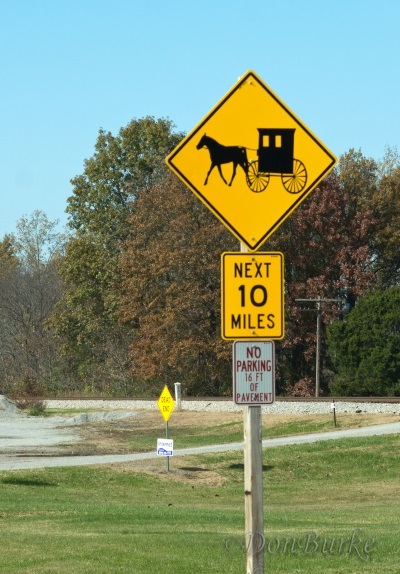 IMO one of the must-stop Amish communities is Jamesport in the NW part of MO. I have traveled there extensively, have tons of pictures from the area, and can give you more info. if you’re interested. Don, I looked at your photos on Flickr and I am totally in awe of your talent! The photos of the Amish are so beautiful – but the birds – oh man, those are AMAZING. You must be a professional photographer because those are truly artistic, professional photos. Just phenomenal – thanks so much for the links to the albums. Wow…, I don’t know what to say. Thank you for your very kind and generous compliments. But in fairness to *real* professional photographers out there, I think I’m more blessed than talented: Blessed with good equipment, and more so blessed with some great opportunities to capture some amazing subjects. I’m not sure which bird pictures you are referring to, but I’m guessing that it’s the eagles and other birds of prey in AK, and esp. the Raptor Center there in Sitka. When a fellow is as close as we were, and has some good equipment — and takes over 300 pictures of the birds there — well, even blind luck will have you come up with a few pretty good shots. But again, thanks for your generous compliments. You are a humble man. Good accoutrement only goes so far – and every ‘real’ photographer takes photos in the hundreds – very few get your results with those birds (there’s one eagle that’s staring you in the eye as he’s swooping down – totally awesome). But also with your photos of individuals in the Amish Community, discreet (yet revelatory). 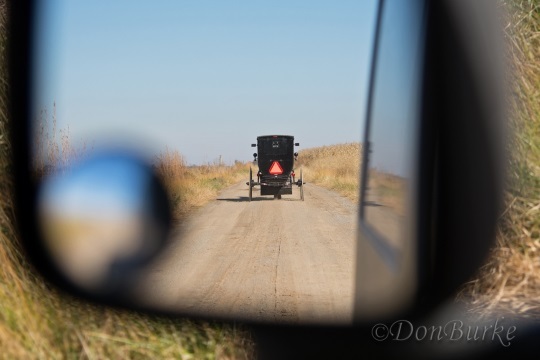 I could not stop looking at the one from the Ohio set where the Amish cart driver is looking behind at the station wagon coming upon him in a blur, yet he’s going slow enough to remain in focus – it made me feel a bit of what the Amish must feel when riding in a buggy with no seat belts, no titanium structure, no airbags and an engine that could decide to bolt on a whim, traveling with one’s dearest children – at the mercy of a two ton machine/monster that’s coming up on them fast. That photo instilled fear in me. To make someone feel empathy, or just to feel something at a photo means – you’re a *real* photographer. Some of the trees in my area are turning color already, it is very strange for August, but as much as there has been some lovely weather on the shores of Lake Ontario where I live, its been fairly cool this year, odd, in fact, yesterday (August 29, 2015) was one of the hotter days we had hereabouts. 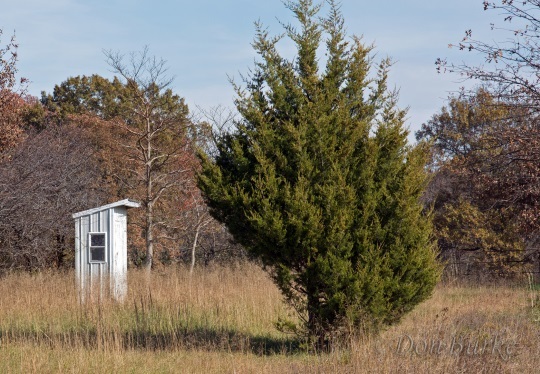 with that, I can only imagine what else Amish hunters might do with their prizes [aside from meals – I enjoyed the deer meat I ate my Aunt and Uncle’s during our reunion]…. Do you know how far these communities are from Peoria, Illinois? I was there recently and wanted so much to visit Arthur but I just could not squeeze in the time, I’m thinking perhaps these communities are closer. I am so sorry to be slow in replying to your question, Loretta. For some reason AA isn’t notifying me of new comments here, and I just have to remember to check back from time to time. 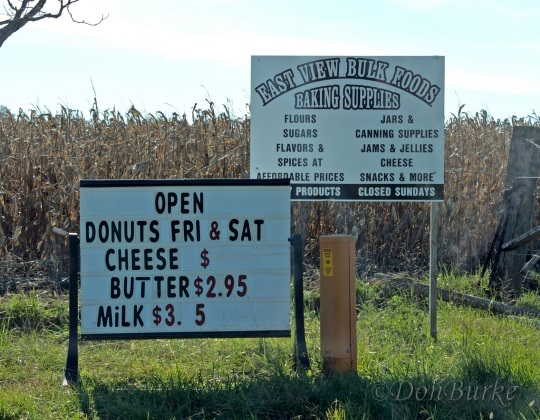 Yes, bakeries and bulk food stores are must-stop-shopping when going through Amish land! But note that all of the places except for Arthur are quite small, so any given one may or may not have stores or other places of interest that you might be looking for. Often the smaller communities are not as touristy-friendly — which doesn’t bother me, but not everyone would enjoy these like I do. Thanks, Don, I went to the link, interesting reading. I appreciate you taking the time to help 🙂 I’d like to go back to Illinois but not sure it will happen. Loretta, you might also consider other options, like Amish communities in IA or MO — some within like 150 miles of Peoria. The same PDF file you looked at earlier will include listings for these (and other) states.